Ontario Climbing – Kolin Powick, Black Diamond's Climbing Category Director. While Kolin Powick was already well known within the climbing industry, it was only after he started publishing his popular QC Lab series on Black Diamond's website (more about that below) that he became a recognized name to the average climber. 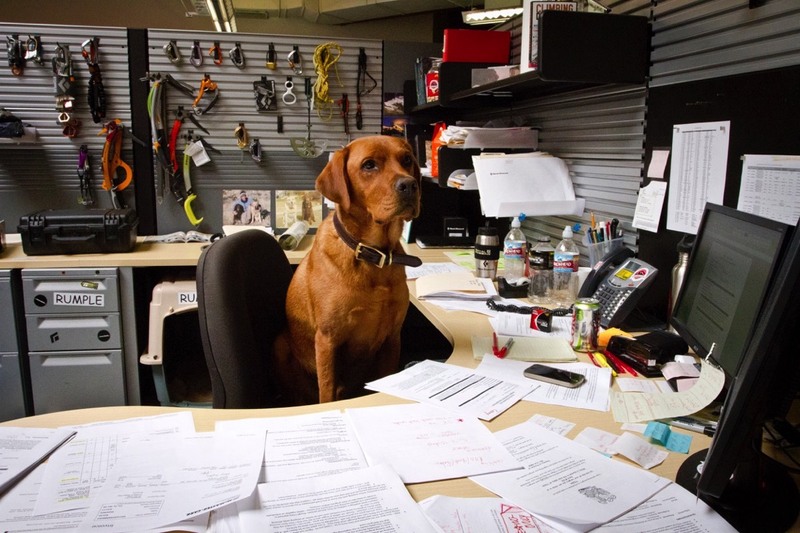 Now working as the Climbing Category Director at BD, we caught up with Powick and discussed the challenges of working on climbing gear, some common misconceptions climbers have about gear, new industry trends and Rumple's status as the best dog ever. Product testing prototype Black Diamond gear. Some folks may not know this, but you are originally from Canada. So how the heck did you land a job at Black Diamond (BD)? 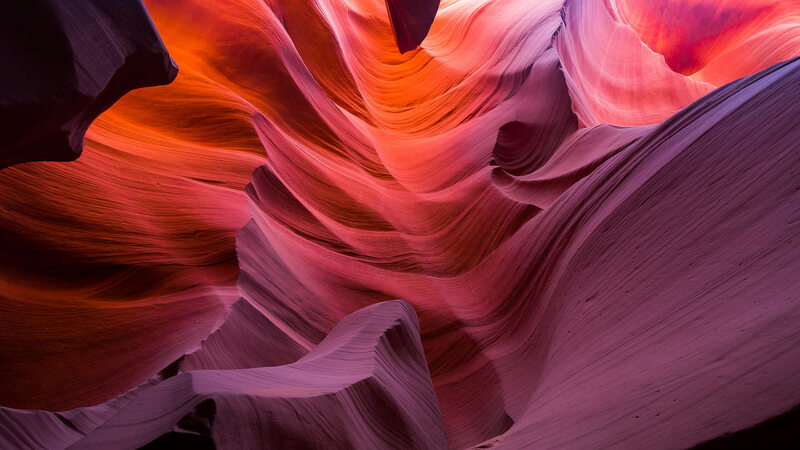 Kolin Powick: Many years ago, my wife and I got married and went on a one-year climbing honeymoon traveling across the US – following good conditions and checking out tons of different areas. At the end of the year, we decided to stay in Salt Lake City where we could both find engineering jobs and had access to climbing and skiing. I was working as an engineer in the manufacturing industry when BD was looking for a climber engineering-type guy to head their Quality Department and tracked me down. When the category director for Climbing and former Director of Quality does EXACTLY what the design engineers ask him NOT to do! You are currently the Climbing Category Director at BD, but you started your career at the company as the Director of Quality. Can you describe what your job involved when you were running that department? 1. We were responsible for ensuring the quality, which encompasses strength, durability, usability, etc, of all new products before they went into production. The team mainly focused on life dependent product (climbing gear), but put the same amount of care into all BD products. We basically created tests to put the gear through the paces – destructive testing, cyclic testing, thermal shock, field testing, etc. 2. Once the product was in production, we were responsible for ensuring the consistency of the product coming off the manufacturing line. This included quality tests and inspections from raw material, work in process, in-line proof testing, and finished goods batch testing. The Black Diamond product testing never ends. What were some of the more interesting things you noticed during the 11 years you were the Director of Quality? Kolin Powick: As far as interesting things – that’s a tough one as you see a lot over 11 years. Everything including accident investigations and crazy misuse scenarios. Over time, you notice the changes in climbing gear and new consumer expectations for climbing gear. Ok, so tell us about your current job as the Climbing Category Director and how you transitioned into that position? Kolin Powick: About four years ago there were some changes going on at BD and the opportunity arose to become Climbing Category Director. 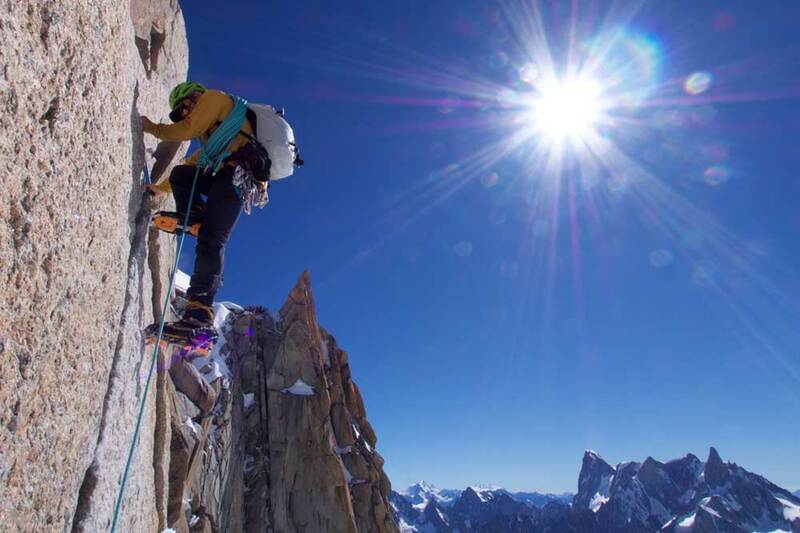 We have four categories at BD: Climb, Mountain, Ski and Apparel. I head the Climbing Category. Nothing happens in a bubble, so to say that I’m in charge is a bit inaccurate – many folks have input. My job entails being responsible for the category from a product and business level. 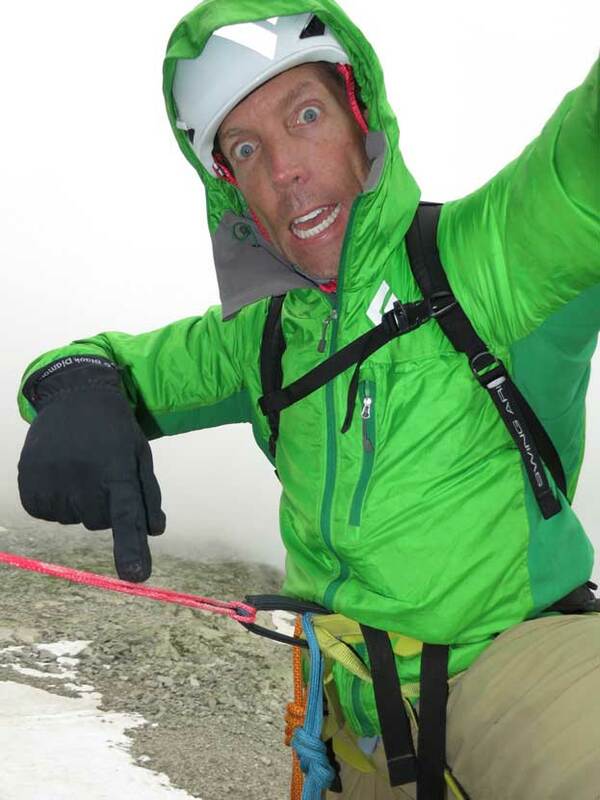 I’m keeping an eye on the market and determining what BD needs to do in order to ensure we have the gear that climbers need. I sometimes describe my job as a human funnel – there are many ways that information comes into me – from customers, employees, friends, athletes, my wife, myself – all as users with opinions. My job is to distill this information and try to make the best decision to help move the category forward and ultimately make the best climbing gear in the industry. Kolin Powick's better half (Ellen) leading the way. 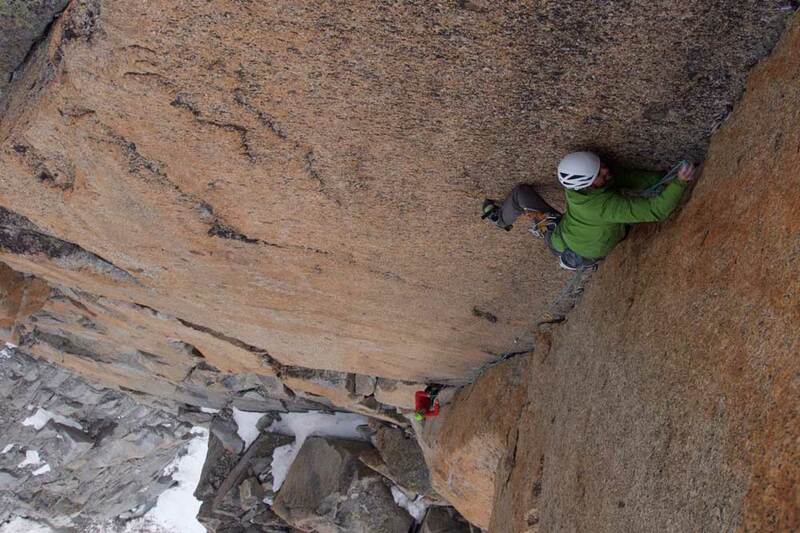 What do you think is the biggest misconception folks have about climbing gear? Kolin Powick: Without a doubt that it’s unbreakable and it lasts forever. Climbing gear does NOT last forever, and we’ve proven many times – if you try hard enough, you can break anything. Climbing gear is super robust, but it won’t last forever, and you for sure can tweak it in different situations. Gear from today is substantially lighter than 20 years ago. That usually means less material, and less material usually means less durability – so your crampons today, that are half the weight of crampons from 20 years ago, are just not going to last as long as your old school ones. But they sure are lighter which makes carrying and climbing in them much more enjoyable, plus they just perform better allowing you to push the limits in the hills. Designing climbing gear sounds like a dream job. What are some of the best things about your job and what are some of the challenges folks outside the industry may not initially appreciate? Kolin Powick: It’s super rewarding getting to be involved in the creation of cool gear that allows me, my friends and tons of people around the world to enjoy themselves in the mountains. And it’s also super fun being able to work with so many like minded folks. But as I continuously tell my parents – it’s not just climbing all the time and all kicked back and chill. It’s a REAL job. Long hours, deadlines, stress, heated discussions, etc. It really is just like many other jobs out there – it just happens to be working on cool stuff that I’m really passionate about. 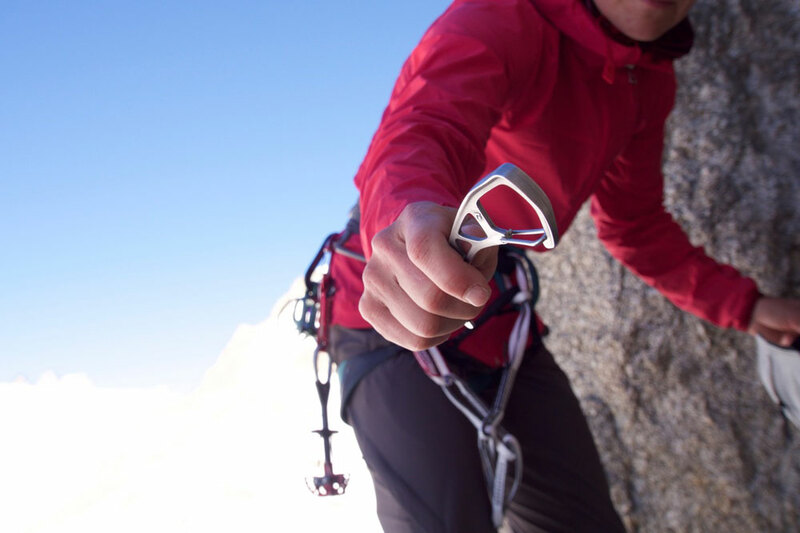 In your opinion, what qualities define the ideal piece of climbing gear and do you have any examples? Kolin Powick: Performance. It all comes down to performance – which includes many things like ergonomics, ease of use, durability, reliability, weight… but at the end of the day, it just comes down to performance. Look at the Camalots and now the UL Camalots. Enough said. Black Diamond Camalot X4 Offsets and Ultralight Camalots being put to good use. Do you see any interesting emerging climbing-gear trends? Kolin Powick: Another great question – things are getting lighter obviously and will likely continue to do so – and as mentioned above, this often results in less durability – and end consumers need to be aware of that. Purpose built product – way back, you had one rope and used it for everything, you had one harness, and it worked for everything. 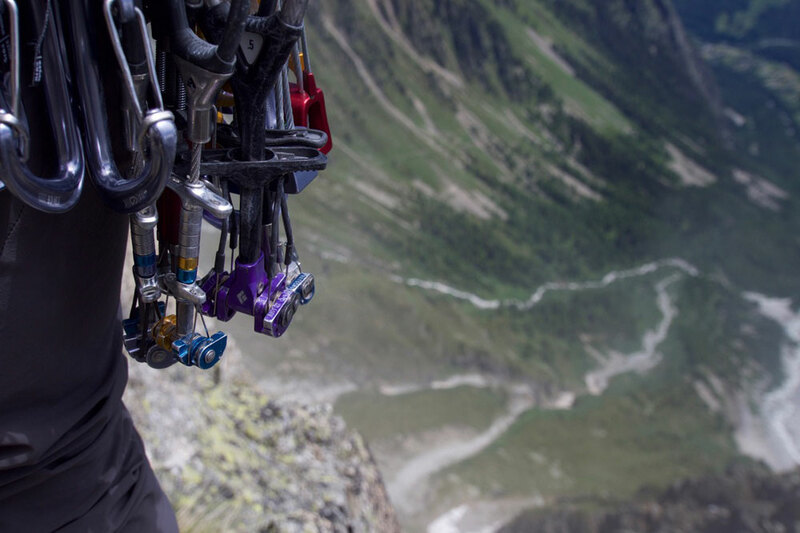 Now, products are becoming more specialized: lightweight alpine harnesses, big wall harnesses, single rope belay devices, double rope belay devices. The gear is being more specifically designed for the end-use. Gyms – obviously the gym scene is blowing up. There are now gym specific products from gym draws and gym shoes to gym harnesses, and we’re coming out with a gym specific chalk bag. Limited knowledge users – a bit of a tough one to describe, but back in the day people often learned about climbing from a mentor, would go out, hopefully not get killed and the day was a success. People read books and just kind of figured it out. Times have changed. Kids are going into the gym, climbing 5.12 after a few weeks and taking it outside. One thing you may have noticed over the years is the attempt to make the gear more usable to folks with limited knowledge. The best example is the old double-back harness buckle which is all but extinct. Now all harnesses are speed buckles, or always doubled back. This is one less thing the user needs to worry about. Same with belay devices. Tubers are going away slowly, and people want ‘safer’, auto-type, ‘locking’ belay devices – from the Grigri style, to geometry assisted belay devices like the new one we’re releasing soon called the ATC-Pilot. This mentality is very challenging for all gear manufacturers, because no matter what you do, climbing is dangerous. You just can’t take the danger completely out of climbing. 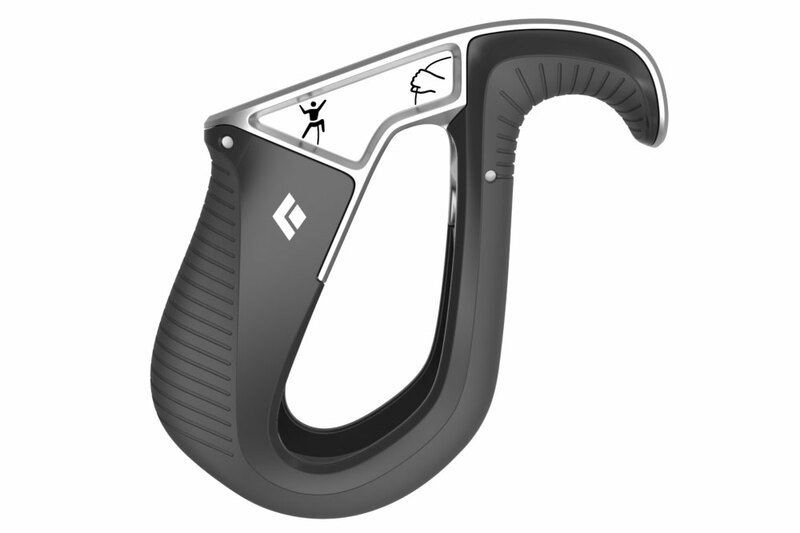 The new Black Diamond ATC Pilot belay device. Tell me about the web page on the BD site called QC Lab. How did it come to be, and what’s it all about? Kolin Powick: Whenever I was out climbing, I would always strip sketchy gear from crags or out in the mountains, bring it in to the lab and break it – just to see how weak old worn gear was getting. It was pretty interesting stuff, so I started publishing my findings on the BD Website – just to try to educate folks about how gear wears, that you can’t always trust fixed gear, etc. People really responded quite positively enjoying the accessible technical articles so I just kept it going. I would always bring stuff back from a weekend, or maybe see someone do something sketchy, or maybe even do something semi-sketchy myself. So I would write it up and just put it out there as some info that people could chew on. Nothing is ever overly scientific, almost always very limited number of data points, and not intended to be overly comprehensive, once again rather to try to get nuggets of hopefully useful information out to the masses with the end goal of making people more aware and hopefully safer while climbing and/or at least questioning things. This last year we partnered with Rock and Ice Magazine – they’ve been re-broadcasting a bunch of my stuff – so even getting more eyes on it, which is great. The more people the better. I often get comments on the articles, and even suggestions for other tests to perform. I think trying to educate folks about the realities of climbing in the field is super important – and I’ve been attempting to do it for over 15 years now. With the QC lab articles, attending various rock and ice climbing festivals and more recently bringing a portable gear breaker to demonstrate how things break and why – I think educating current and future climbers is key. It’s never really been part of any official job function I’ve had, and I kind of try to squeeze it in whenever I have time – but once again, in today’s age of apparent lack of mentorship coupled with fast progression and easy access to gyms, I think the more information that can get out to users' hands, the better. Testing cam slings at the QC Lab. Testing cams at the QC Lab. Rumple. Best dog ever – true or false? Kolin Powick: Absolutely true. There are somewhere around 40 dogs at BD on any given day – they’re all pretty darn good and they all get along, but there’s no doubt Rumple is the best. He’s been coming to work with me almost every day since he was seven weeks old. He’s almost nine years old now – he’s been there longer than many of the folks. Rumple taking a break from his work duties at the Black Diamond office. "It's hard to find a comfortable spot to nap." "Hmm, this is a bit better." "Perfect, now to catch up on my sleep!" Rumple hard at work in the Black Diamond office. Is there any new yet-to-be-released BD gear that you are particularly excited about and can you share any details? Kolin Powick: My friends always ask what we’re working on, and I say ‘everything’. We have a small army of engineers that are literally working on climbing gear 24/7. Our new ATC-Pilot belay device is really pretty awesome. 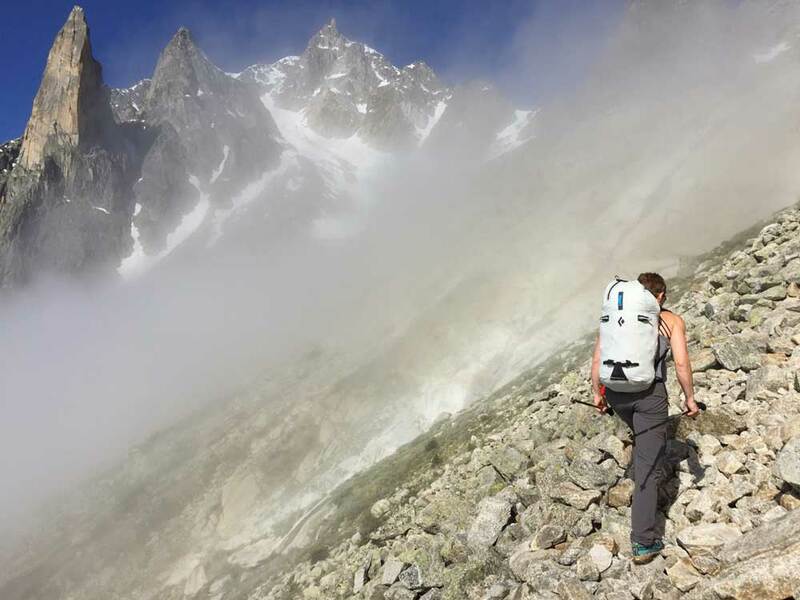 We have a new crag pack, new women’s specific helmet, offset stoppers, gym chalk bag, a super cool new ultralightweight alpine harness – but the biggest thing being released this fall (actually earlier in Canada) is rock shoes. Yes, BD is coming out with Rock shoes and we’re super excited. We’re bringing our engineering know-how to blend new world tech with old school craftsmanship and have some cool shoes to show this summer. The New S18 Black Diamond Women's Focus Climbing Shoe. The New S18 Black Diamond Climbing Shoe Family. The New S18 Black Diamond Shadow Climbing Shoe. The New S18 Black Diamond Women's Momentum Climbing Shoe. The New S18 Black Diamond Men's Momentum Climbing Shoe. Finally, any upcoming “product testing” trips?